It’s tested. Not only is Unleashing the Hidden Potential of Your Student Leaders practical, but the ideas found in it are all tested. I’ve actually used them in my own ministry to develop our student leaders. It’s applicable to ministries of all sizes. So often, it feels like youth ministry books are geared towards those working in big churches – which is NOT where most youth workers work. Student leadership, however, is more than a program. It’s a means of discipleship that’s applicable regardless of whether you have 10 or 1000 students in your ministry. It’s applicable beyond the walls of your youth room. When you equip student leaders, you give them leadership skills that benefit the rest of your church, as well as their schools, homes, and communities, not just while they’re in your youth ministry but long after they leave it. Whether you’re a rookie or veteran youth worker, I’m convinced Unleashing the Hidden Potential of Your Student Leaders will help you change student leadership from a mythical idea into a transformative reality. Get your copy here! 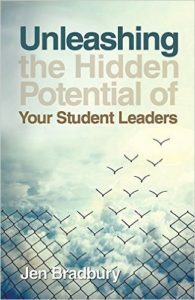 Today, I’m thrilled to be giving away a copy of Unleashing the Hidden Potential of Your Student Leaders. To enter to win, comment below with one question you have about student leadership OR one struggle you have in this area of ministry. A winner will be chosen from those who comment on Thursday, May 3 so check back after that to see if you won! What a great question! And what a blessing to have your daughter and son-in-law be youth pastors! Do you tend to think it’s best to have student leaders serve in areas they enjoy, or do you think it’s also beneficial to push them in areas that are outside of their comfort zone? Maybe a mixture of the two? A great question that I discuss in the book. The short answer: I think it’s best to have student leaders serve in areas in which they have some natural giftedness. However, student leadership is very much about helping students to discover their potential so we also have to call out those areas because students do not always know them. What’s the ideal number of students serving and how do you do transitional leadership well? This is discussed in the book as well. The short answer: The ideal number fluctuates based on how many students apply. I struggle with the balance between seeing potential to develop a new student leader vs. wanting to develop someone that really is not interested in becoming a student leader. Absolutely! You are not alone in this struggle. I would encourage you NOT to put students on your team who are not really interested in becoming a student leader. That’s why I advocate for a self-selection process that includes a written application and interview. Putting teens on your team who do not want to be there actually harms your entire team more than it benefits the one person in question. You start slowly, with a few! You pour into and invest in them and watch to see what God does! In what areas do you sacrifice time from in order to prioritize student leadership? In every area! If we truly believe in the power of student leadership (which I do!) then I’m willing to sacrifice time from every area of ministry in order to pour into these teens and cultivate a team that flourishes. Congrats! You won the copy of Unleashing the Hidden Potential of Your Student Leaders. Let me know where to send it! How do you disciple and motivate youths and youth leaders who themselves are so busy in and stressed out by school and struggle themselves with spiritual disciplines, balance of time and committing to meetings/trainings and church? 1) Be clear about your expectations from the get-go. I recommend doing this by establishing a team covenant. 2) Give your student leaders a say in scheduling their meetings. When they schedule meetings themselves, it’s much easier for them to prioritize them than it is when you tell them when and where they need to be. How do you get kids to realize their full potential as leaders despite their age and then strive to attain their potential? Students have SO much potential! Affirm it – whenever you see it. Then encourage them to put it into practice and to take risks, even if they fail. Help student leaders to process and learn from their failures. What’s the best way to celebrate student leadership that leaves the church walls and programs and is truly impacting the community? Realize that the skills you give students as they lead are transferable beyond the walls of the church. Explicitly help them to see that! Over the years, I’ve heard from student leader alums who routinely share how the skills they learned from our student leadership team impacted them as they interacted with friends in high school and college and led a variety of clubs and student organizations. My student leaders are very strong; committed, and for the most part, quite mature in their faith. How can I make sure I remain strong, and worthy of leading them? Prioritize your own faith and walk with God. You can’t take people where you haven’t gone yourself. Model humility. When you screw up, be honest about your mistakes. Ask forgiveness when needed. Take risks and be willing to fail. Learn from your mistakes. Admit you’re not perfect and that you’re learning to be a better leader as well! What i the best way to start and sustain a student leadership team? SLOWLY! With humility and a few teens who understand the vision of your team.